High heels are a must-have for many a fashionista. They can bring an element of class and elegance, give you a fun and flirty look, or be shocking and provocative. Whatever your personal tastes and styles, high heels can really help take your look to the next level. Here are 3 tips on how to wear high heels without pain. It may seem pretty basic, but even the over-the-counter shoe inserts made for high heels can be a tremendous relief to your fabulous looking feet. These inserts look like small oval cushions and are often made of silicone. They are meant to go under the balls of your feet to alleviate pressure and foot pain from high heels. Silicone inserts, in particular, hold your foot in place as you move around throughout your day to keep your foot from sliding around in your shoe and creating blisters and friction discomfort. Give yourself glamour breaks throughout the day so that your feet don’t get overworked looking so stunning. You can do this while sitting at your desk, on breaks or whenever is most convenient for you to kick of your heels and kick up your feet for a few seconds. However you work it into your day, just make sure you are doing it. Stretching your feet helps with their circulation along with being beneficial for muscle, tendon and ligament health. Foot problems from high heels can occur for a number of different reasons. Arguably the most notable, as well as the most preventable reason for this discomfort comes from wearing the wrong size of high heel, or not knowing how to properly support your arch. A person’s foot size can change with time, age and most significantly after having children. It is important that you be aware or your current, actual foot size when shopping for your newest shoe obsession. Measuring your foot once every year or so will help you determine if your foot size or width has changed at all. There are a number of factors that can contribute to someone experiencing pain in the arches of their feet. Peroneal Tendonitis and Tibialis Posterior Tendonitis are conditions relating to the structure of the arch, and arch pain can occur due to these conditions. However, there are also steps you can take to prevent arch pain and, potentially even structural damage. Looking at a print of your foot can help you determine if you have a high or low arch. This information will allow you to shop for shoes that are more comfortable for your foot and help you to know if arch inserts are something worth looking into. Being chic and fashionable doesn’t have to mean feeling aching agony with every step you take. Whether it is at the office or out on the dance floor, you deserve to look your best while also being able to feel your best. 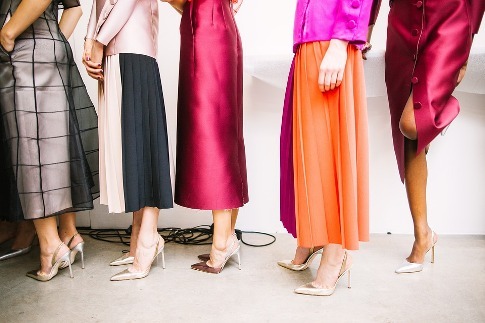 When it comes to high heeled fashion footwear, beauty doesn’t have to mean pain.